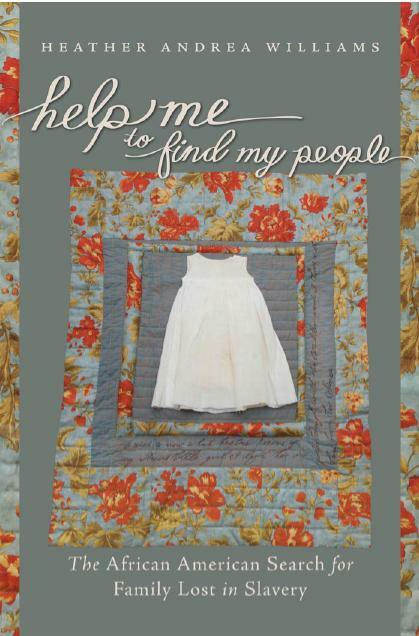 In her new book, Help Me to Find My People: The African American Search for Family Lost in Slavery, University of North Carolina history professor Heather Andrea Williams turns her attention to a third kind of newspaper communication—Information Wanted notices posted by African Americans themselves. After the Civil War, this was one of the ways that former slaves sought to find their loved ones. It’s interesting that “this is how black people showed up in the newspaper most often in that century,” notes Williams in a recent phone interview. “The runaway ads are about money, offering a reward to get ‘property’ back,” she says. In contrast, the Information Wanted ads launch “an emotional appeal.” But rather than providing physical details of the missing person, whose appearance may have changed with the passage of time, they typically use the owner’s name as an identifier. “That one is really poignant because it raises lots of issues which people contended with,” Williams says. How do you find someone after a separation of more than two decades? “How do you find someone whose name was Betty, knowing that the owner could have changed her name at any point? “There’s hope. There’s pain. There are multiple emotions in these ads,” Williams says. It’s unknown how many enslaved families were split up or how many were able to reunite after the Civil War. In her book, Williams cites one estimate that from 1820 to 1860, about 800,000 African Americans were sold or moved from the Upper South to the Lower South and West. That figure doesn’t include the separations that took place when slaves were relocated within the same state. “Even a distance of a few miles could be insurmountable if they did not know where they were or if traveling was too dangerous or would trigger physical punishment or sale,” she writes. My name is Garland H. White. In Hanover County, in this state. *Descriptions of runaway slaves excerpted from Stealing a Little Freedom: Advertisements for Slave Runaways in North Carolina, 1791-1840, Edited by Freddie L. Parker (Garland, 1994). This entry was posted in History, slavery and tagged 19th century, advertisements, families, Heather Andrea Williams, history, Information Wanted notices, research, slavery by Susan Frith. Bookmark the permalink.